One of the many wonders of the DC Animated Universe Original Movies is how easy they make efficient storytelling look. Even hokey and overexposed characters like the man of steel become interesting when made the focus of a DCAU project. The inherent corniness of these characters is revealed in the overly simplistic way that their origins and back stories were conceived. That's why every few years they have to be revamped, since they were made as diversions for a simpler time. Somehow, the DCAU is able to provide quality contemporary entertainment without betraying the quaint sensibilities that birthed these characters. That is a skill that often eludes the very best of comic writers. Grant Morrison managed to crack that nut with his All-Star Superman Series, which will now be incorporated in the fabric of the DCAU. 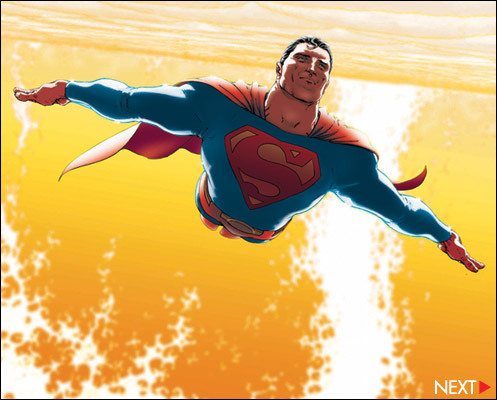 The upcoming All-Star Superman is the animated send up of Morrison's work. The recently released trailer shows that the animators have remained faithful to the style and character designs of artist Frank Quitely, maintaining the established tradition of every DCAU feature having its own visual identity. Superman has always been a difficult character to keep interesting as his invulnerability and omnipotent pedigree make it hard to foster a sense of danger or consequence in his adventures. This trailer does that from the outset. At this point, I think it would be wise for Warner Brothers films to place a temporary moratorium on all live-action adaptations (save for Chris Nolan's projects) and dump all of those hundreds of millions into theatrically released DCAU films. It would result in a much more satisfying product.